My copy of the second edition of the Genealogy Standards Manual written by the Board for Certification of Genealogists (BCG) has arrived. The most significant changes center around the use of DNA evidence in genealogical research. The standards are meant to be a general guideline. They aren’t meant to give specific suggestions for specific problems. 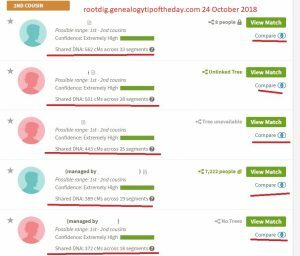 If you are looking for a template to follow when using DNA for your genealogical research, you won’t find it. That’s never been the intent of this standards manual. The intent (at least from my perspective) is to help researchers have a framework on which to structure their research and their analysis. Even if your goals are not to be a professional researcher, not to be certified, and not to publish, there is still something to be gained from reading the manual for those who wish to improve their research skills and their analysis. There is a glossary of definitions for the terms discussed in the book. Even if a researcher does not necessarily agree with everything in the manual, there’s much to contemplate when reading it. And to be honest, some things are probably debatable or subject to your own comfort level or personal perference. I don’t include citations to the documents that are used in every blog post–and the manual suggests that is something that should be done. Most of the images I use are from sources that can be determined by reading the blog post. We will be discussing the manual in more detail in upcoming posts.